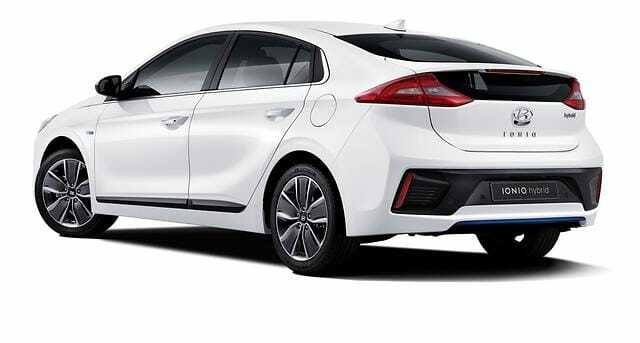 January 7, 2015 – Following its unveiling to domestic media at Hyundai Motor’s Namyang R&D Center in South Korea, details have been confirmed of the IONIQ - the next generation of hybrid vehicles. 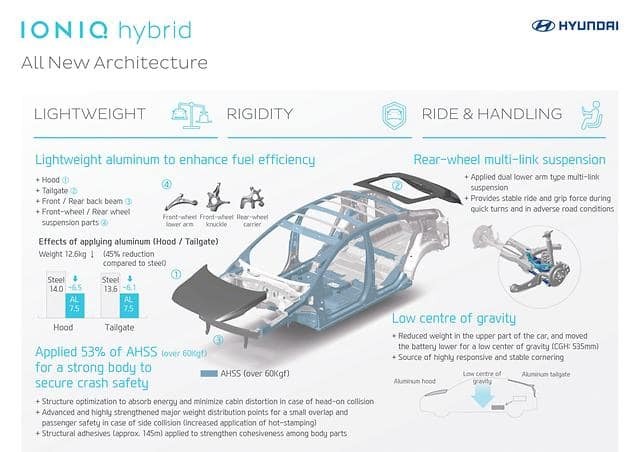 Built on a chassis created specifically to carry the world’s first choice of three efficient and ultra-low emission powertrains, the IONIQ boasts 53% Advanced High Strength Steel combined cleverly with lightweight aluminum. The new model saves 12.6kg (45%) of weight by casting non-structural bodywork from aluminum, such as the hood, tailgate and suspension components. Where crash structure or energy absorption is necessary, the structure features Advanced High Strength Steel that can withstand significant collision forces. The new model was created with dynamic ride and handling at its core, a characteristic that sets the IONIQ apart from other hybrid vehicles. Positioning the car’s batteries low and forward achieves a low center of gravity that enables highly responsive, stable cornering. The IONIQ furthers its handling prowess with dual lower arm multi-link suspension fitted at the rear. 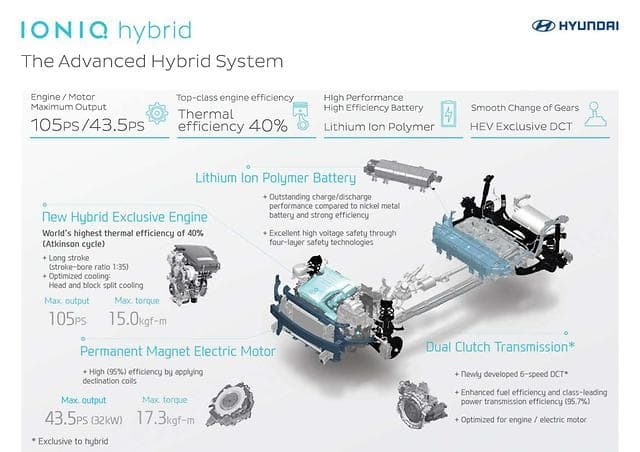 With the world’s highest thermal efficiency (40%), the new 1.6-liter Kappa GDi engine developed exclusively for Hyundai Motor’s hybrid engines, combines with the permanent magnetic electric motor to deliver maximum outputs of 105ps and 43.5ps - engine and motor respectively. Within the engine, class-leading thermal efficiency of 40% is achieved, while the head and block is split for optimized cooling. Plus, the 200 bar high pressure 6-hole direct fuel injector further improves fuel consumption and CO₂ emissions. Alongside this, the Lithium Ion Polymer Battery delivers outstanding charge and discharge performance, optimizing output from the high voltage motor and allowing for rapid regeneration. Controlling power distribution is a hybrid-exclusive Dual Clutch Transmission (DCT), which presents a dynamic driving experience unique to IONIQ. Class-leading power transmission efficiency of 95.7% delivers a prompt response, acceleration performance and smooth gear changes to delight drivers with handling alongside the hybrid’s efficiency. Established in 1967, Hyundai Motor Company is committed to becoming a lifetime partner in automobiles and beyond. The company leads the Hyundai Motor Group, an innovative business structure capable of circulating resources from molten iron to finished cars. Hyundai Motor has eight manufacturing bases and seven design & technical centers worldwide and in 2014 sold 4.96 million vehicles globally. With almost 100,000 employees worldwide, Hyundai Motor continues to enhance its product line-up with localized models and strives to strengthen its leadership in clean technology, starting with the world’s first mass-produced hydrogen-powered vehicle, Tucson Fuel Cell.